2016/2017: The Church was devastated by a fire that resulted in the loss of the roof, windows and interior finishes. The masonry exterior walls remain and there have been encouraging signs the Church may be rebuilt. 07/2010: The Diocese which controls the church property is now renting it to a small local congregation. 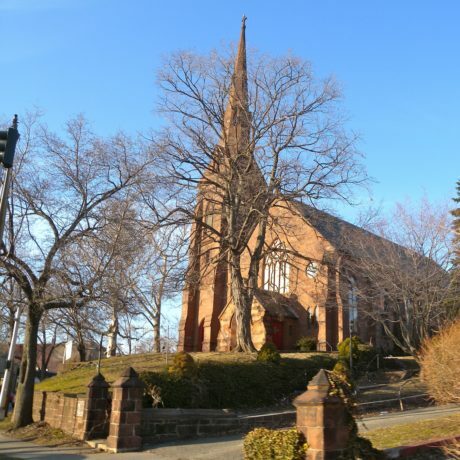 Situated on 2.5 acres overlooking the center of West Orange, St. Mark’s Episcopal Church is an outstanding example of Gothic Revival architecture. The original section of the brownstone church was built in 1827. An 1860-1861 addition, including a steeple, was attributed to renowned architect Richard Upjohn. No significant physical or structural changes have been made to the church in over 90 years. As with many urban churches throughout the state, the congregation has dwindled greatly and the funds are not available for maintenance or restoration.